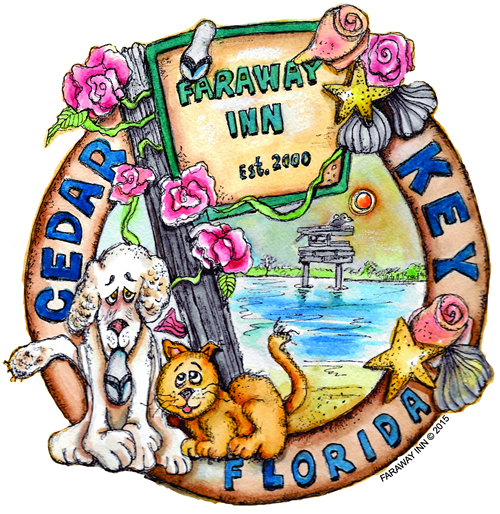 Faraway Inn is set within a quiet, attractive residential area, within a short 5 minute walk past Victorian and traditional Cracker homes to restaurants, bars, convenience stores, shops, boat launches, the public beach and city dock. Accommodations are ground floor, spread over half a city block of gardens. Cottages and efficiencies equipped with stove/oven The Faraway Inn property was once the site of the Eagle Pencil Company Cedar Mill (circa 1870 – 1896). The mill was damaged in the 1896 hurricane and storm surge. The once plentiful stands of red cedar were becoming sparse and brought the end of the enterprise. Pet Friendly!